Through British design and manufacture. Working with Capstan & CASE, BFS has developed a low drift nozzle for use with Pulse Width Modulation (PWM) nozzle bodies. 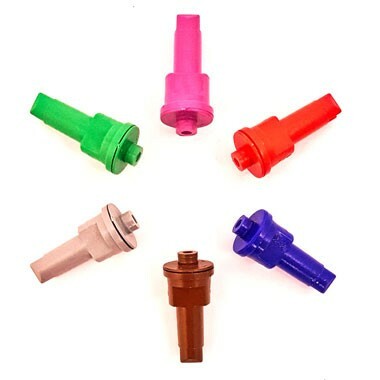 Since the early days of PWM, BFS have been marketing PulZar nozzles throughout Canada and North America, and now the PulZar nozzle systems are being offered on machines coming onto the UK Market. PWM controls each nozzle separately, and the flow rate from each nozzle is managed by rapidly switching the nozzle control solenoid on/off. The duration that the cycle is "on" is called the Duty Cycle and varying this duty cycle provides the operator with the ability to control the volume output from each nozzle. The system can cope with afive fold change in forward speed without affecting output. PWM Bodies will enable the correct application from each nozzle even when going around a corner wher the outer edge of the boom is travelling much faster than the inner edge, so giving a lower rate of application. PWM corrects this by changing the duty cycle at each nozzle to compensate accordingly. Flat Fan nozzles have been the main jet used but these are now prone to create small, driftable droplets. The PulZar is a low drift jet perfectly suited to PWM systems, with up to 75% lower drift than conventional flat fans.